WELCOME TO FINE ART FOR SMALL SPACES! ​"Celebrate all that is wonderful in this world"
Create an oasis in your world with nature paintings that can put the finishing touch to your most cherished spaces! I cover your sales tax! ​I'M HELENA AND I WANT TO HELP YOU CREATE AN ART FILLED OASIS IN YOUR WORLD. If you want prints or cards I have those too! Take a look around because I change things up to add new art, cards and prints often! Discover your own unique piece of art that will become a cherished family memento for generations! Feel free to spread the joy of nature art, and again, thank you for visiting! Privacy is king and your information will remain confidential! ​"Fill Your World With Nature's Song"
You love nature, but are too busy to get out there as often as you would like! Invite the outdoors in with small scale miniatures sure to brighten your tiniest nook, and your day! Find your favorite animal in Fauna, your favorite flower in Flora, a soothing or dramatic water in Aqua, a meditative or moody landscape in Terra, or wide open cloudscapes in Sky to complete your personal haven....and keep you inspired for your next outdoor adventure! Flowers have character, no two are ever alike! 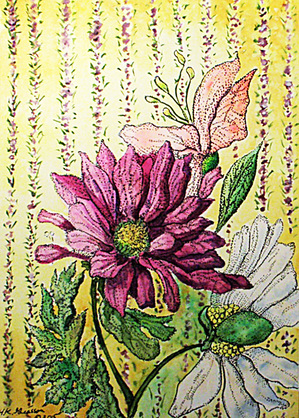 Nouveau posters inspired me to add India Pen and Ink to most of my watercolor flower paintings, giving them a stylized look. Add visual drama to your space with a flower that never fades! Take a journey of art inspired by nature's creations. I know they can bring some color and joy into your life! Are you ready to bring home the finishing touch to your personal vision?